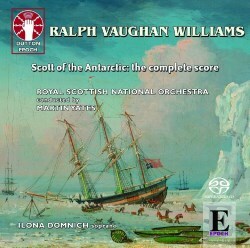 I am sure that aficionados of the music of Vaughan Williams will need no reminding that his 7th symphony – The Sinfonia Antarctica – is derived from the music that he had composed for the film ‘Scott of the Antarctic’, released in 1948. This admirable SACD from the equally admirable Dutton Epoch gives us, for the first time, all of the music he created for the film, including parts which were not actually used in it. We can thank the musicological efforts of conductor Martin Yates for this, especially since less than 50% of the music we hear here was actually used in the film. RVW composed the music in about six weeks in 1947 and subsequently took from 1949 to 1952 to write the symphony, which shows that the composer felt that creating a true symphony required more effort than just stitching sections of the film score together. I should say that not being a film watcher, I have not seen ‘Scott of the Antarctic’ nor have I heard CD presentations of the original sound recording. The music on this disc plays almost like an extended symphonic suite and is immensely enjoyable. I was immediately struck by a difference from the 7th symphony; at the very outset the film music starts with several chords on the harp which are not present at the symphony’s opening. Later we hear a jolly Edwardian type march – not at all like RVW – to represent The Queen’s Birthday, which really made sit up because at that point I hadn’t read the notes. This curious interlude is followed by what sounds like a brass band intoning ’Will ye no come back again’ which is played as the ship departs Cardiff docks. A short piece of quintessential Vaughan Williams went virtually unheard in the film – this is a lovely 2’34” invention for harp and strings and then oboe, created to give us a musical setting for Oriana, the wife of Wilson, a colleague of Scott. I have played this over and over because it is so beautiful. As it happens, I am a long standing member of the Vaughan Williams Society, and nearly always respond positively to his music, but please do not think that I am unswervingly loyal to his output – if this were a review of ‘The Sons of Light’ or the 1952 Violin Sonata or even the Eighth Symphony, I would not have been at all fulsome in my comments. The production is first rate, with copious, nay exhaustive notes by Lewis Foreman which detail the genesis of the piece and its structure. There is also an informative article by Martin Yates in which he details some of the decisions he made in putting the component bits together. The recording is exemplary, allowing the full weight of the orchestra to be caught, but also allowing the more diaphanous passages to be presented clearly. The conductor Martin Yates guides the orchestra in its excellent playing and the Russian soprano Ilona Domnich demands special note for her beautiful wordless singing – she has a lovely voice and I would like to hear more of her, record producers take note! The women of the RSNO chorus are also to be heard to beautiful ethereal effect. Enthusiastically recommended to all admirers of Vaughan Williams’s music, and especially to those interested in film music of the period.